Their hands protected by layers of tightly bound tape, the players take turns swatting a small, hard ball at speeds that reach 115 kilometers (71.4 miles) per hour. They are playing a match of Pelota Vasca, or "Basque Ball," a sport popular to its native Basque region that overlaps northern Spain and southwestern France. The game is similar to squash, but played without a racket and with only three walls. The court is called a "Fronton," and players can play the ball off the front, back and the left-side wall. The right wall is missing. 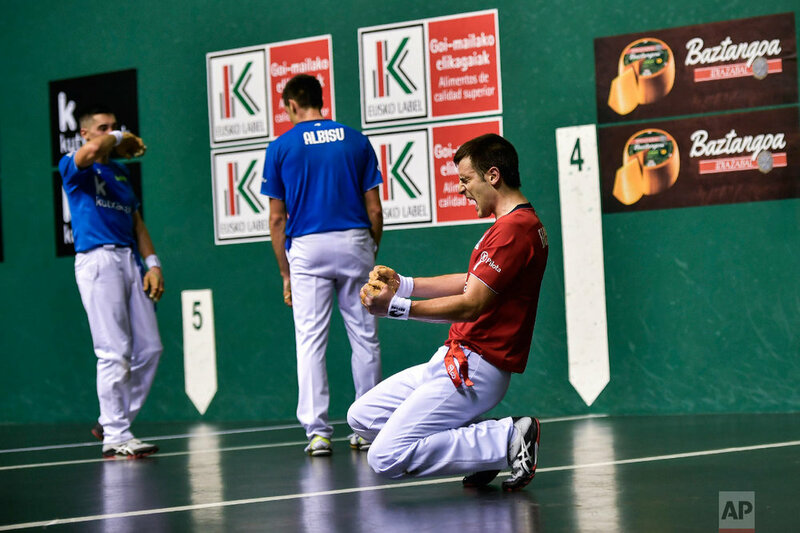 Now it is a professional sport played indoors with organized tournaments in northern Spain played by individuals or doubles, where many spectators bet on the winner. As a trophy, the winner of the annual championship is awarded a large green Basque beret, called the "Txapela." The champion is called the "Txapeldun." Players, called "pelotari," can spend an hour before a match preparing their hands. They coat their fingers and palms with a wax covering that they first heat up with a flame. Then they wrap each finger in layers of tape and some thin foam padding to reduce the risk of injury. Text from the AP news story AP PHOTOS: Spanish Basque Ball players use hands to hit ball.